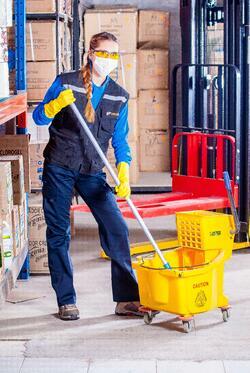 When it comes to facility cleaning, this is a more than common debate. Everywhere you turn there are different sources defending both sides of the argument. First, let’s talk about what bleach is. “Sodium hypochlorite” – aka common bleach, has remained one of the most consistently used cleaning products to date because it has the ability to kill the tougher than average pathogens. Despite being used since the early 1900s, some recent concerns have grown about the misconception that common bleach actually contains free-standing chlorine. In reality sodium hypochlorite is manufactured from salt and water, making it a water solution – containing no elemental or free-standing chlorine. Another major cause for concern with using bleach is its respiratory effects. 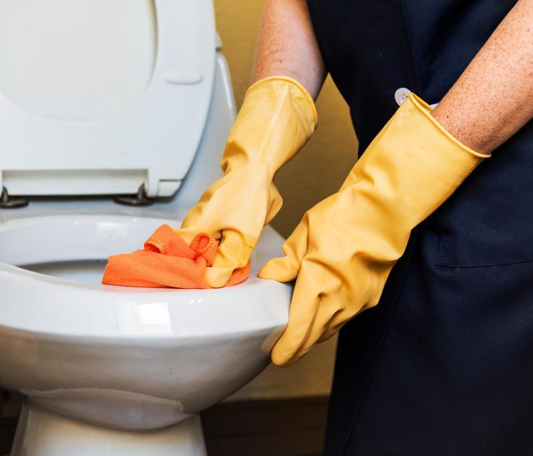 Many believe that the second you can smell bleach while working with the chemical that you have put yourself in danger of experiencing respiratory issues such as asthma or bronchitis. The smell should not be an indicator of danger when working with bleach in the correct manner as described in the instruction label. The human nose can actually detect chlorine at .002 ppm, but health risk and irritation occur at much higher levels than this. A great way to lower your risk of these fumes is by using proper ventilation when cleaning with the product – fans, open doors and windows, and ventilation systems are key to safety. In order for bleach to be a safe product to use in facility cleaning the instructions MUST be followed accurately. A study by the water Quality & Health Council in 2010 concluded that 82% of Americans did not know the right amount of bleach to use in the kitchen and worse than that almost half of the survey respondents overestimated how much bleach to use. Every time someone uses a bleach solution that is inaccurately mixed they are at risk. If they put less bleach in than the instruction label calls for than they are at risk of not killing the pathogens and germs that can cause illness and if they use too much bleach they are putting themselves in harm’s way to the risks of the chemical. A few other ways to protect yourself while using bleach are to wear eye protection, rubber gloves to avoid skin exposure, clothing that covers your skin from potential exposure to the chemical, and to wash your hands immediately after use. Bleach is a chemical that needs to be handled with caution and in a manner that does not put the user at risk, but as long as it is handled properly bleach is NOT guaranteed to cause health issues or danger. This chemical has many great uses, but it does not need to be used in every aspect of cleaning. There are other products that could be a better fit for certain parts of your facility cleaning. Picking the right products can be difficult but luckily, Action Unlimited Resources can provide you with the “Ultimate Cleaning Supply List for Any Facility” and a Free SmartSite Analysis to provide you with a personalized list of supplies to find the best fit for your specific needs!